Big Bill with his Gibson Style O guitar, as pictured in the 1941 Okeh race records catalog. Previously on Old Time Blues, we took a look at one of the earliest records made by the illustrious Big Bill Broonzy, featuring the two rambunctious rags “Saturday Night Rub” and “Pig Meat Strut”. Now that the time to pay birthday tributes to Mr. Broonzy has rolled around yet again, we turn our attention to another piece of work dating to one month earlier in Big Bill’s long and extensive career. After his first 1927 and ’28 Paramount records brought little commercial success, Big Bill took a hiatus from recording. Come 1930 however, he made his triumphant return, sitting in on an American Record Corporation session on April 8th, backing Frank Brasswell on two characteristic blues sides, then joining with the “Famous Hokum Boys”, under the auspices of founding member Georgia Tom Dorsey, to cut a re-do of the classic “Somebody’s Been Using That Thing” and three hot guitar rags. The following day, Bill got his own time in the limelight—after a fashion—when he recorded three solo efforts of his own, “I Can’t Be Satisfied”, “Grandma’s Farm”, and “Skoodle Do Do”, all released under the pseudonym “Sammy Sampson”. 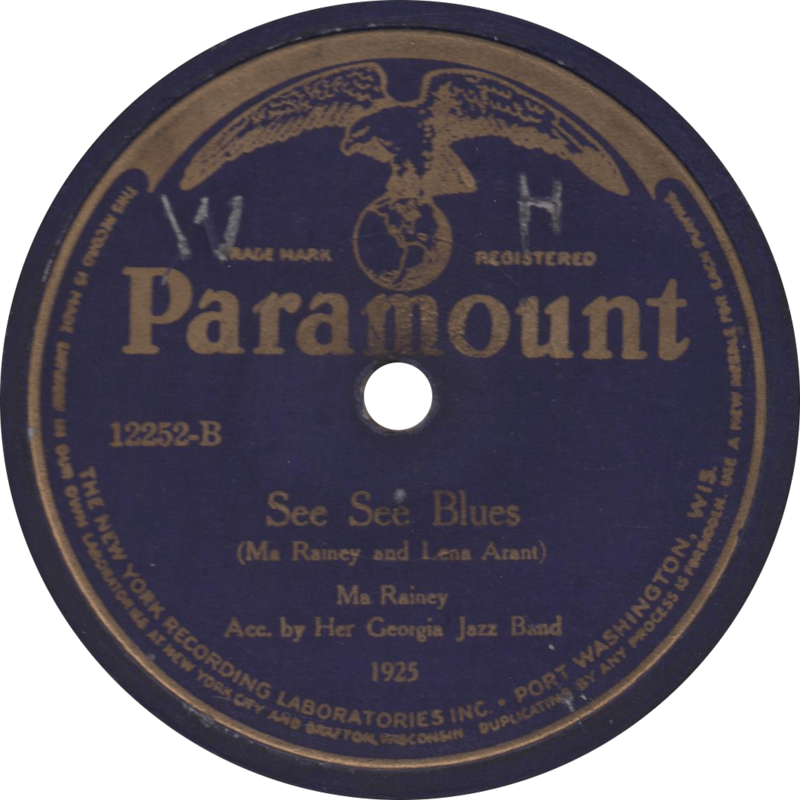 Bill continued to record under that name—excluding the results his three or four excursions to Richmond, and one to Grafton—until 1932, when the ARC (and Bluebird, for a time) finally decided to start putting out his records under his own name, albeit without his last name credited, which didn’t make it onto labels until he started recording for Mercury in 1949 (save for composer credits, which were often attributed to “Willie Broonzy” of “Williard Broonzy”). 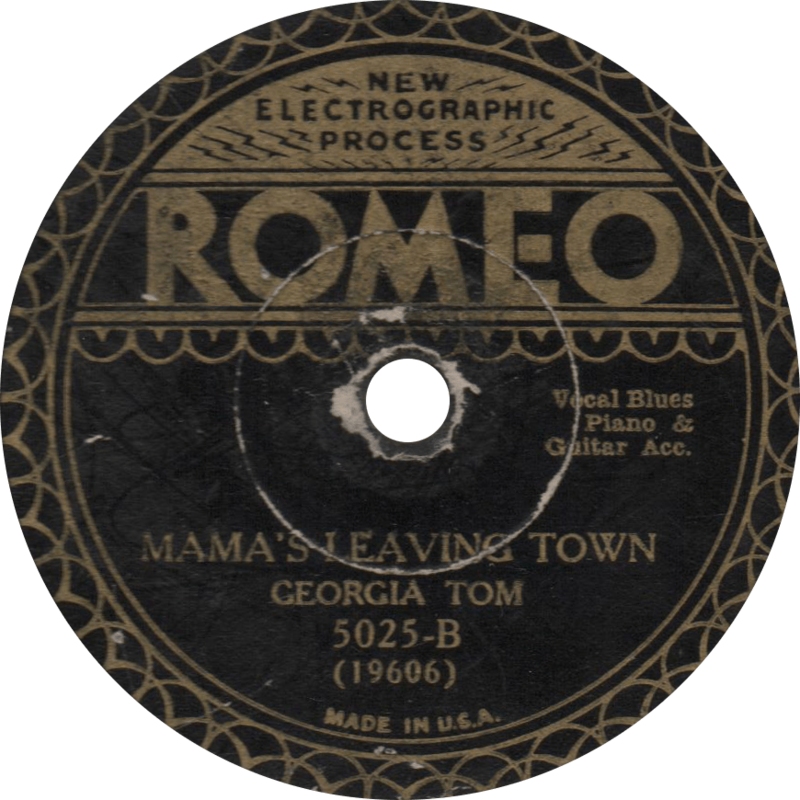 Romeo 5025 was recorded on April 9 and 10, 1930 in New York City. “Sammy Sampson” is, of course, a pseudonym for Big Bill Broonzy. It was also issued on Oriole 8025 and Jewel 20025, and side “A” also appeared on Perfect 157 backed with “Skoodle Do Do”. The 78 Quarterly speculated “more than thirty [copies] on all labels,” making it perhaps not quite rare, but rather scarce nonetheless (if we’re going to split hairs), while the Perfect issue was estimated at “less than fifteen”. On his outstanding “I Can’t Be Satisfied”, Big Bill is accompanied by his usual partner in his early days, the flatpicking Frank Brasswell, on second guitar. To be frank, Big Bill’s earliest works were sometimes rather hit or miss; this one’s a hit—enough of one that it was covered by Bob Wills’ Texas Playboys about six years later. It’s like rock ‘n’ roll twenty years early, only better—one of Bill’s best recordings, in my opinion. 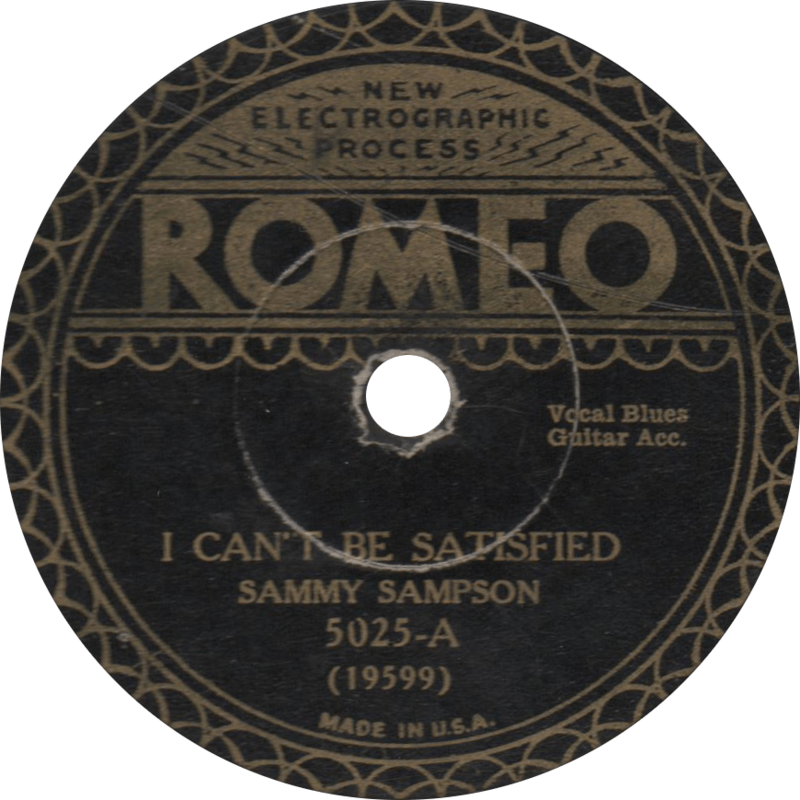 I Can’t Be Satisfied, recorded April 9, 1930 bu Sammy Sampson. On the flip-side, Georgia Tom Dorsey sings “Mama’s Leaving Town” in a characteristic style much in the same vein as his “Grievin’ Me Blues”—in fact, the two have very similar melodies. He is accompanied by Broonzy on guitar. If the song was a little peppier and hokumier, it probably would’ve been credited to the “Famous Hokum Boys”. Mama’s Leaving Town, recorded April 10, 1930 by Georgia Tom. Perhaps the most popular “race” artist of his time, smooth city-slicker Leroy Carr played the blues in a more sophisticated style than his more country counterparts. Beginning with his “How Long – How Long Blues”, Carr’s music steered the blues away from its rural roots toward a new and more urbane direction, followed by countless budding artists in his wake. Leroy Carr was born on March 27, 1905 in Nashville, Tennessee, but not long after wound up in Indianapolis to stay. Carr taught himself to play piano and left to join a traveling circus—then the Army—in his young adulthood, but by 1922, he came back to Indianapolis and settled down with a wife and child. There, he teamed up with guitarist Francis “Scrapper” Blackwell and gained a reputation for playing the blues at rent parties and nightclubs. Carr also became a part time bootlegger and a full time alcoholic. In the summer of 1928, the Vocalion record company traveled to Indianapolis in search of new marketable talent, presenting Carr with the opportunity to make his first record. Scrapper Blackwell did so first, recording “Kokomo Blues” and “Penal Farm Blues” on June 16, and Carr joined him in the studio three days later to cut “How Long – How Long Blues” and “My Own Lonesome Blues”. That record turned out to be a smash success, covered even by down home country blues hit maker Blind Lemon Jefferson, and soon Carr was in high demand. He traveled with Blackwell to Chicago two months later to make more records for his return to the Vocalion studio, with whom he continued to record through 1934. As one of the best-selling “race” artists, he recorded prolifically, and had another big hit with “Blues Before Sunrise” in 1934, and he also toured successfully with Blackwell. At the beginning of 1935, Carr switched to Bluebird Records, starting out with the successful “When the Sun Goes Down”, which fast became a blues standard. Unfortunately, Carr’s alcoholism took its toll on his health, and his habitual drunkenness caused a rift between him and Blackwell, who parted with him acrimoniously in the middle of his first Bluebird session. That session also turned out to be his last, for Carr soon after fell ill with nephritis and died on April 29, 1935, a little more than a month after his thirtieth birthday. His legacy was carried on by artists like Bumble Bee Slim and Peetie Wheatstraw, who modeled their careers after his influential piano and guitar style, and in later years by Nat King Cole and Ray Charles, who drew inspiration from his smooth and laid back blues. 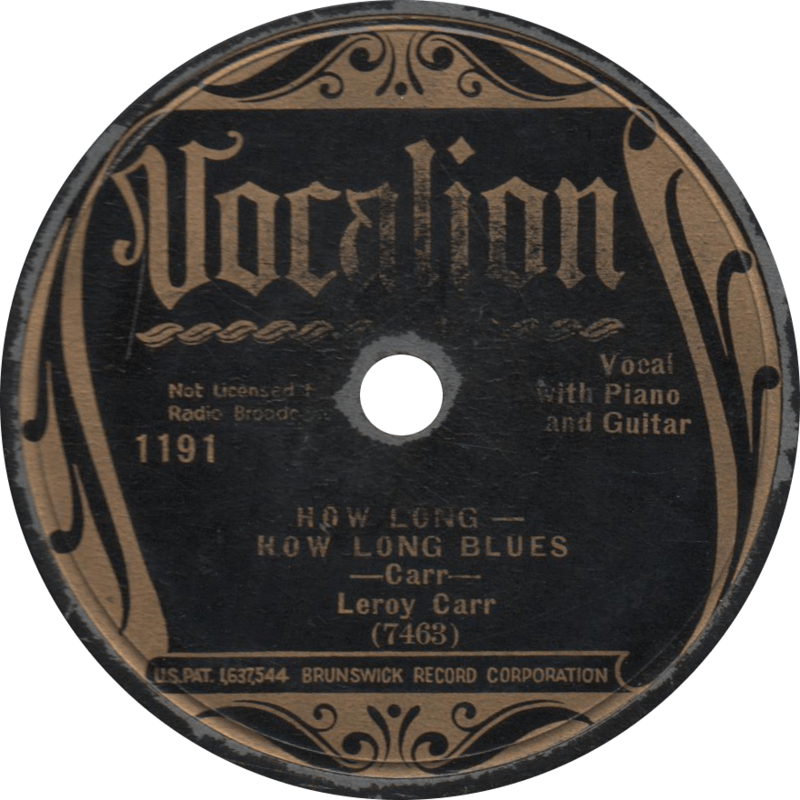 Vocalion 1191 was recorded on June 19, 1928 in Indianapolis, Indiana by Leroy Carr, singing and piano, backed by Scrapper Blackwell on guitar. It was Carr and Blackwell’s first record, together or separately. This copy was pressed in 1935 or ’36, as indicated by the black and gold “scroll” style label. It was also reissued on Banner 32557, Oriole 8166, and Romeo 5166. That it was still for sale nearly a decade after it was originally made—combined with its well-worn condition—present a testament to just how popular this record was. First, Leroy Carr sings his big hit, the immortal “How Long – How Long Blues”, later covered many times over by countless artists, even breaking out of the blues genre and into jazz, and others. Though known as a Carr original, the song has its roots in earlier songs, such as Ida Cox and Papa Charlie Jackson’s “How Long, Daddy, How Long?”, and shares a common melody with “Sitting On Top of the World” and its many offshoots. It’s success was so that Carr followed up with “How Long How Long Blues-Part 2” and “Part 3”, “The New How Long How Long Blues” and “Part 2”, and “How Long Has That Evening Train Been Gone “. How Long – How Long Blues, recorded June 19, 1928 by Leroy Carr. 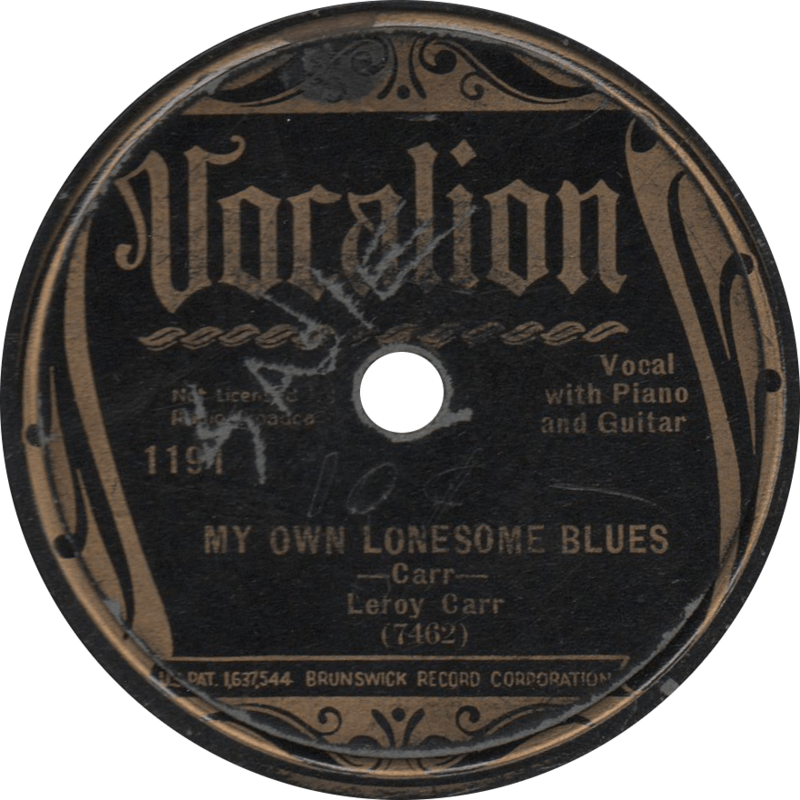 On the reverse, Carr sings “My Own Lonesome Blues”. As you can probably tell, Sadie must’ve enjoyed it quite a bit—at least until she decided to sell it for ten cents! My Own Lonesome Blues, recorded June 19, 1928 by Leroy Carr. Out of all the countless blues musicians whose lives are shrouded in obscurity, it would be rather difficult to pick one about whom less is known than Seth Richard. Indeed, historians like Bob Eagle and Eric LeBlanc have been able to piece together a small few biographical details, which is more than can be said about some of his contemporaries, but even that remains rather tentative. Seth Richard was born around 1905, purportedly in North Carolina, whereabouts of Halifax County, though Bedford County, Virginia origins have also been proposed. Likely, he spent his early years in the vicinity of southern Virginia and northern Carolina. Given that all of his recordings were made in the New York and New Jersey and two of his titles reference streets in Newark, New Jersey, it would seem probably that Richard lived a considerable part of his life in that area, but that is purely speculation. As a musician, he was counted alongside Barbecue Bob, Blind Willie McTell, and Lead Belly as one of the handful of blues artists to adopt the twelve-string guitar. He was in New York City in 1928, when he went to Columbia Records to make but a single record, which became a rather decent seller in the “race” catalog. Thereafter, he went silent until late in 1943, when he (probably) resurfaced to cut four sides including the wartime “Gas Ration Blues” under the pseudonym “Skoodle-Dum-Doo”, after one of the songs he recorded for Columbia fifteen years prior, for Irving Berman’s Regis and Manor record labels with a harmonica player known only as “Sheffield” (possibly John Sheffield). Whatever became of Seth Richard after his brief and well spread-apart recording career is unknown. 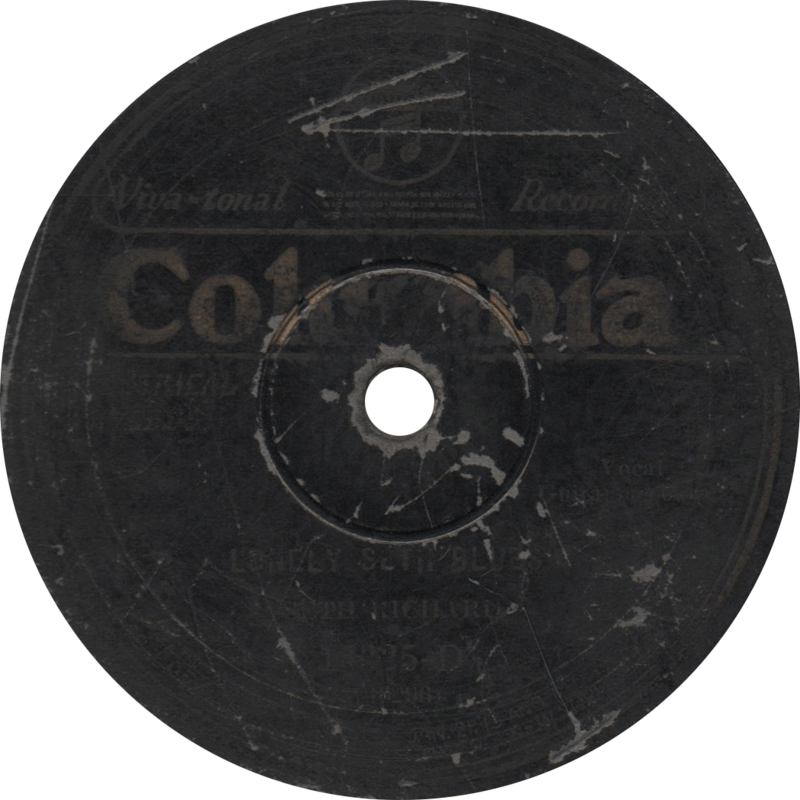 Columbia 14325-D was recorded on May 15, 1928 in New York City. Seth Richard sings, accompanying himself on twelve-string guitar and kazoo. The DAHR notes takes “2” and “3” as issued for both sides; these are both take “2”. First, Richard sings the plaintive and eponymous “Lonely Seth Blues”. Lonely Seth Blues, recorded May 15, 1928 by Seth Richard. Next, Seth gets wild on his signature song, “Skoodeldum Doo”, a jazzed up adaptation of Papa Charlie Jackson’s “Skoodle-Um-Skoo”. 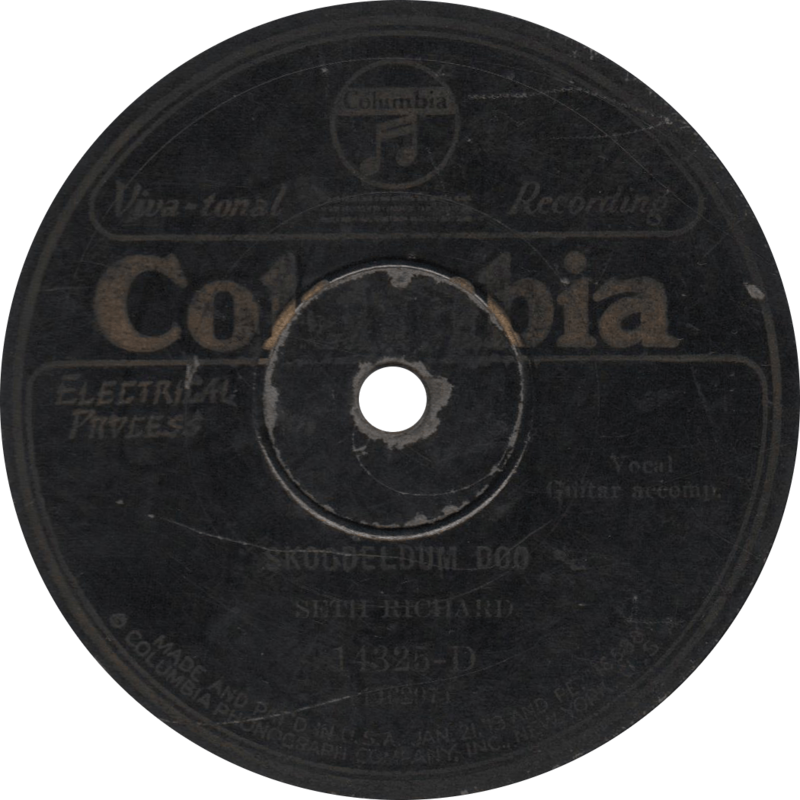 Skooodeldum Doo, recorded May 15, 1928 by Seth Richard. Some people cast aspersions on the quality of Bumble Bee Slim’s body of work, declaring it to be inferior, or “unbluesworthy”. I can’t speak for his entire body of work, because I’ve only listened to a fraction of it, but I think both these sides—particularly the latter—are quite excellent blues sides of the more urbane variety epitomized by Leroy Carr, which proved to be the most commercially profitable style in the Great Depression days than the country blues most coveted by collectors today (and I can’t claim to not be a part of that bunch). Amos Easton was born in Brunswick, Georgia on May 7, 1905. He learned to play the guitar, and ran off to join the circus at the age of fifteen. Winding up in the Midwest in the early days of the Great Depression, Easton made his debut recordings under the name “Bumble Bee Slim” in Grafton, Wisconsin for the faltering Paramount Records in October of 1931, resulting in six sides backed backed by slide guitar, including an adaptation of Memphis Minnie’s “Bumble Bee”—from which he presumably derived his stage name—as “Honey Bee Blues”. Drawing a great deal of inspiration from popular blues duo Leroy Carr and Scrapper Blackwell, Easton recorded again half a year later, this time for Vocalion, producing the popular “B and O Blues” as well as another rendition of Minnie’s “Bumble Bee”, this time under the title “Queen Bee Blues”. From then on, Bumble Bee Slim recorded in earnest with Vocalion from 1932 to ’37, Decca and its subsidiary Champion from 1934 to 1936, and Bluebird in 1935 and ’36 (as “Amos”). 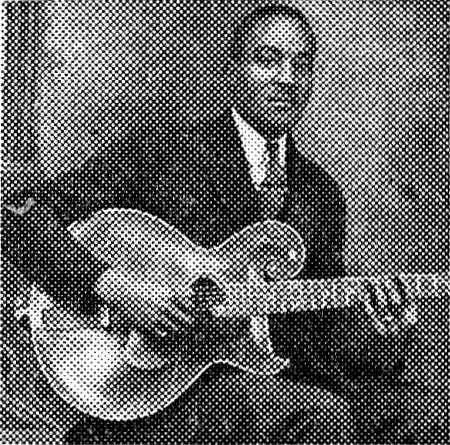 Though able to play guitar himself, Easton did not play on many of his records, and was instead accompanied by a variety of guitarist and pianists, including at various times Big Bill Broonzy and Peetie Wheatstraw. After concluding his business with Vocalion, Easton went home to Georgia. A few years later, he relocated to California, a place in which he had expressed great interest in a number of his songs, and in the middle of the 1940s, Slim began recording again on burgeoning West Coast blues and jazz labels. In the 1950s and early 1960s, he recorded several albums, but could not achieve the success he had known in the 1930s. Amos Easton died in Los Angeles, California on June 8, 1968. Decca 7126 was recorded on July 7 and 8, 1935 in Chicago, Illinois. Bumble Bee Slim’s outstanding accompaniment appears to consist of Dot Rice on piano and Scrapper Blackwell (recording for Decca as “Frankie Black”) on guitar. On the “A” side, Bumble Bee Slim demonstrates an apparent lack of geographical knowledge with the opening verse “the Smoky Mountains is way out in the west.” He delivers “Smoky Mountain Blues” in a style very reminiscent of his inspiration and contemporary Leroy Carr. 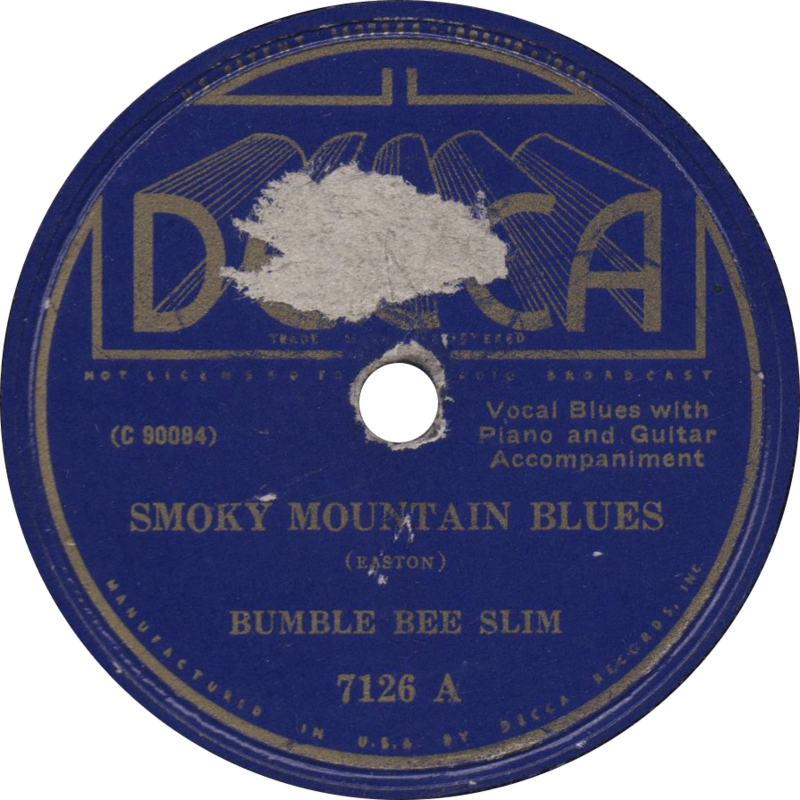 Smoky Mountain Blues, recorded July 7, 1935 by Bumble Bee Slim. On the “B” side Easton sings one of his most popular numbers, his first re-worked version of Buddy Moss’s “Oh Lordy Mama” as “Hey Lawdy Mama”. The song was later adapted as swing by Count Basie in 1938, and subsequently covered by Louis Armstrong, Andy Kirk’s Twelve Clouds of Joy, and others. Easton later recorded the song at least twice more with the titles “Meet Me in the Bottom”, accompanied by Peetie Wheatstraw, and “Meet Me at the Landing”, both in 1936. The guy just couldn’t stop singing it. I prefer this version myself. It is worth distinguishing this song from the earlier “Hey Lawdy Mama—The France Blues” recorded by Long “Cleve” Reed and Little Harvey Hull (The Down Home Boys) for Black Patti in 1927; the two songs share very little in common. 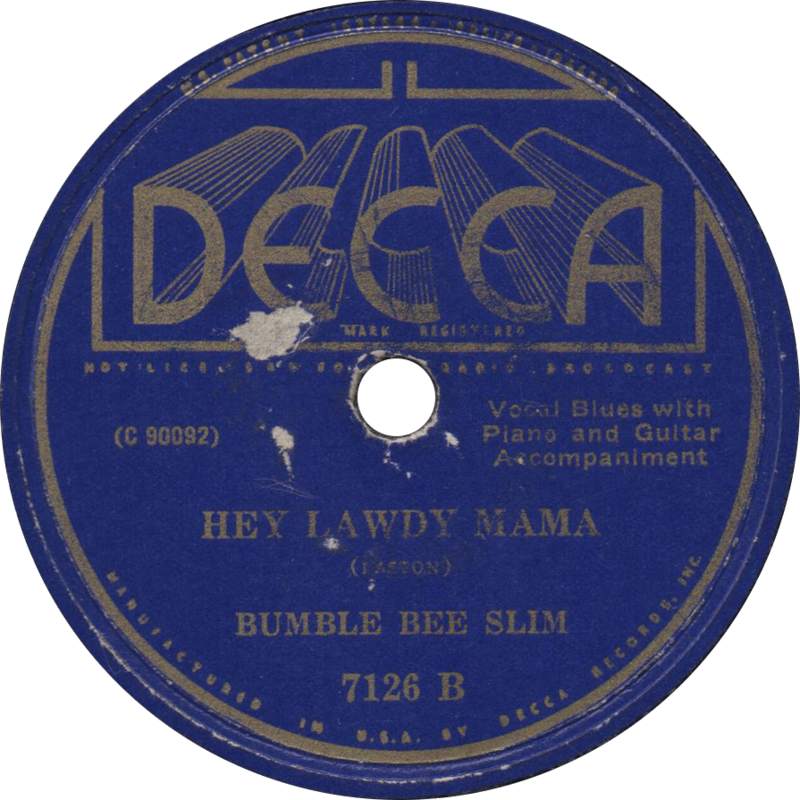 Hey Lawdy Mama, recorded July 8, 1935 by Bumble Bee Slim. 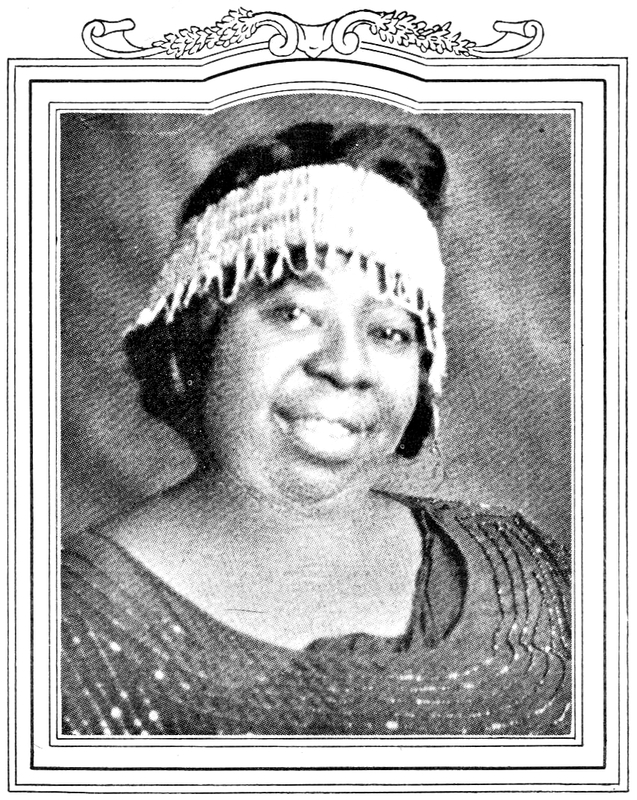 Madam “Ma” Rainey, as pictured in The Paramount Book of Blues, 1927. Perhaps the most flattering portrait of Rainey. Earning the honorific “The Mother of the Blues”, Madam “Ma” Rainey is Indisputably a legend of the blues. Her jazz-inflected vaudevillian blues served to define the genre as it was to be on records and helped to pave the way for future blues recordings by male and female artists alike. “Ma” Rainey was born Gertrude Pridgett on April 26, 1886 (according to most sources, with September 1882 being another possibility). By her own account, she was born in Columbus, Georgia, though latter-day research implicates Russell County, Alabama as the place of her birth, though the former was her hometown in any event. She began her career in the show-business in her early teenage years, when she won a talent contest in Columbus. By the turn of the century, she was performing in southern minstrel shows. In 1904, Pridgett married William “Pa” Rainey and the two toured as part of the Rabbit’s Foot Minstrels troupe, later forming an act called Rainey and Rainey, Assassinators of the Blues. In her travels across the southern states, Rainey encountered a young Bessie Smith in Chattanooga and took her under her wing, teaching her the blues. Come December of 1923, traveled to Chicago and began recording for Paramount Records, an association which lasted through 1928 and produced nearly one hundred recordings. On records, she was accompanied at first by Lovie Austin’s Blues Serenaders, Paramount’s “house” jazz band, before beginning to front her own “Georgia Jazz Band” which at times included the likes of Louis Armstrong, Kid Ory, Buster Bailey, and Fletcher Henderson, with occasional collaborations with Blind Blake, Papa Charlie Jackson, and Tampa Red and Georgia Tom on the side. In the middle of the 1920s, she toured on the T.O.B.A. vaudeville circuit. After the onset of the Great Depression in the 1930s, Rainey retired from performing and returned home to Georgia, managing two or three theaters in Columbus and Rome. Gertrude “Ma” Rainey died in Rome, Georgia on December 22, 1939. Paramount 12252 was recorded on October 15 and 16, 1924 in New York City. Ma Rainey’s Georgia Jazz Band is made up of members of Fletcher Henderson’s orchestra, including Howard Scott on cornet, Charlie Green on trombone, Don Redman on clarinet, Fletcher Henderson on piano, and Charlie Dixon on banjo. On the second date, Scott and Redman are replaced by Louis Armstrong and Buster Bailey on cornet and clarinet, respectively. First up is “Jealous Hearted Blues”, a largely “floating verse” twelve-bar blues song containing lyrics like “it takes a rockin’ chair to rock, a rubber ball to roll,” later notably included in “Jim Jackson’s Kansas City Blues”. It made enough of an impact to be covered by Barbecue Bob’s brother Charley Lincoln in 1927 and was later adapted by the Carter Family as “Jealous Hearted Me” in 1936. 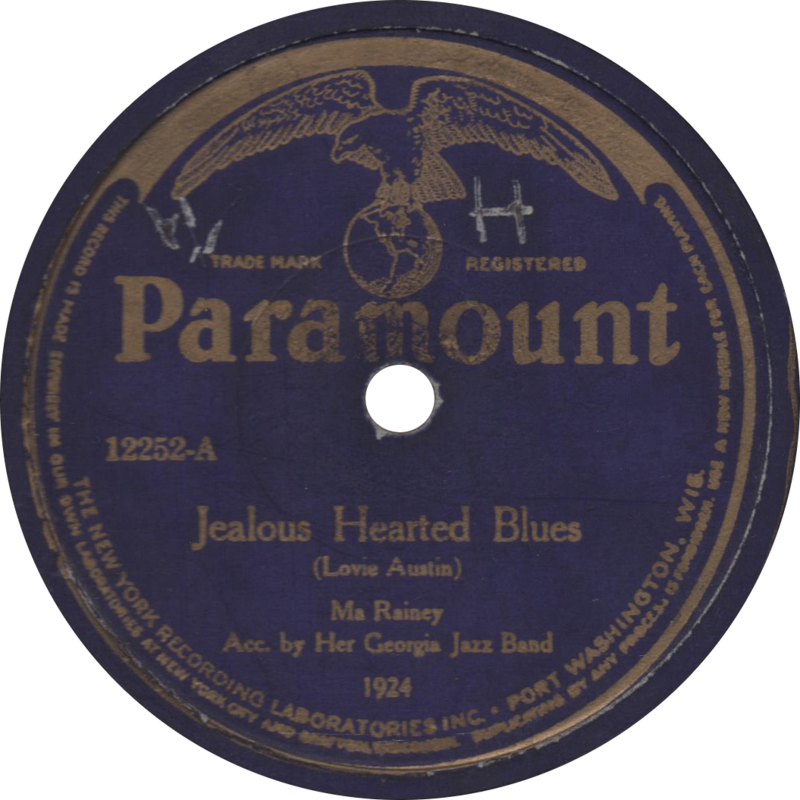 Jealous Hearted Blues, recorded October 15, 1924 by Ma Rainey Acc. by Her Georgia Jazz Band. On the reverse, Ma Rainey sings a legendary performance of her immortal “See See Rider Blues”—often in later years (incorrectly) called “C. C. Rider”, here erroneously titled “See See Blues” on the label. Later pressings corrected this error. See See [Rider] Blues, recorded October 16, 1924 by Ma Rainey Acc. by Her Georgia Jazz Band. I gotta have music, ’cause I’m mad about music, but the music has got to be sweet and hot.